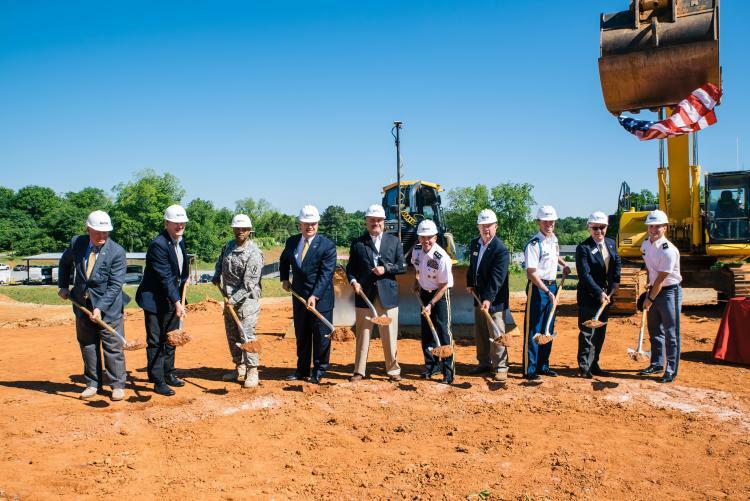 On May 6, Georgia Military College (GMC) officials ceremoniously broke ground for its new Military Science Department building, part of the school’s ongoing investment in its cadet/ROTC programs. The ceremony was well attended by GMC alumni, friends, and community members, including speakers Representative Earl Ehrhart, Mayor Gary Thrower, and Lt.Gen. William B. Caldwell IV, GMC president. Scheduled for completion in August 2017, the new 13,500 square foot, one-and-a-half-story building will house two state-of-the-art classrooms, as well as a conference room, an administrative office, three private offices, two 4- to 6-person offices, a cadet workroom, a reception area, a recruiting office and a break room for the cadre. Located at 430 S. Lincoln Street, the new building will facilitate interaction between the Military Science Department, the GMC Corps of Cadets staff and students by bringing expanded classroom and training space adjacent to cadet living quarters and program offices. The building is also close to the Oconee River Greenway, where cadets regularly carry out physical training. The new building will also honor the past with a “Hall of Heroes,” featuring GMC military program alumni whose service and achievements reflect the values and benefits of a GMC education. Pictured, left to right: Mr. Charlie Garbutt, Garbutt Construction; Mr. John Jefferson, Georgia State Financing and Investment Commission; COL Reginald Neal, Commander, 48th Brigade, Georgia National Guard; Honorable Gary Thrower, Mayor, Milledgeville; Honorable Earl Ehrhart, Georgia House of Representatives District 36; Lt. Gen. William B. Caldwell, IV, President, Georgia Military College; Mr. Randy New, Chairman, GMC Board of Trustees; Lt. Col.(P) Thomas Nelson, GMC Professor of Military Science; Mr. Dudley Rowe, Chairman, GMC Foundation; Cadet COL Kurtis (Lee) Hemrick, Regimental Commander , 137th Corps of Cadets.